The Essential Denim Dress is a design that has ben whirling round in my mind for a while now, and I have finally got it down on paper. It’s perfect for everyday, utilitarian wear. The cap sleeves are part of the main body (how easy!). It pulls in slightly just under the bust and splays gently over the hips. 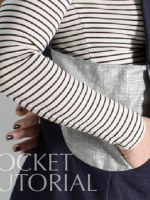 Diagonal lines are always flattering and the under-bust seam balances nicely with the oversized practical pocket. (There is an interesting article here about how diagonal lines work on the body.) There is one dart in the top bodice section and the other dart is neatly hidden in the seam between the bodice and front panel. This tunic is super comfy, but with enough fitting to make sure you have a shape! 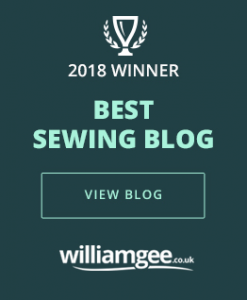 In fact, I’ve done a whole post on the mix and match denim look, complete with advice about how to achieve a TRUE denim feel with a twin needle to create a double line of overstitching (just like on your favourite jeans). 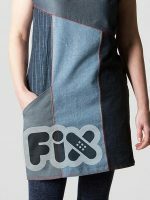 I used bright orange stitching on the Essential Denim Dress in proper Levi style. Denim, by nature, is quite thick, and this slight stiffness helps the dress hold it’s A-line shape. You can find a great range on denims available online at Fabric Time. They do lots of different weights and patterns at a good price. Obviously, you don’t have to stick to denim – you can make up this pattern out of ANY mix and match of fabrics providing they are all a similar weight to one another.For best results, to maintain the boxy tunic look, the fabric needs to be quite substantial. To get this utilitarian look, I would stick to medium / heavy cotton and wools, scuba, ponte or heavy linen. However, if you are looking for something a bit lighter and softer for the summer then have a look at my other version here. It’s made from a textured denim-look polycotton and is paired with a very pretty floral devoré fabric that I picked up on a market stall. The sections of flower fabric that look blue are actually transparent, with a blue lining. Shirting weight fabric would be fine for this look. It’s finished with white twin needle top stitching. The dress has a much lighter prettier look in these fabrics but still holds its shape well. I think it would look great with flip flops and would be perfect to throw on over the top of a bikini. 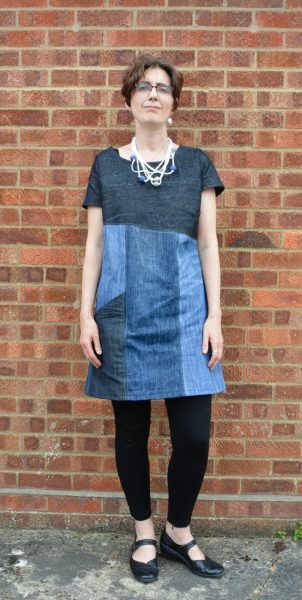 The mix and match style of denim in this dress makes it particularly suitable for an upcycling project. Take a look at Vicki Myers fantastic version of the dress that has been made from several old pair of jeans. She talks you through her process of making it step-by-step and I love her positioning of some of the pre-existing seams. And yes, she has also made that fabulous necklace she is wearing – her website, Vicky Myers Creations is here. 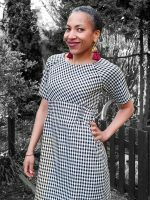 The Essential Denim Dress comes as multisize paper pattern available here. You can find other versions of the Essential Denim Dress to inspire you on the Summer Style blog post. I love that dress ! It is sooo different ! But I have a curvy size and i am not sure I dare to make it for myself. But is is gorgeous! Just found your blog, which is so interesting. Thanks for the free patterns, particularly the denim dress. It looks great, and the perfect way to use up extra metres that you buy on spec. 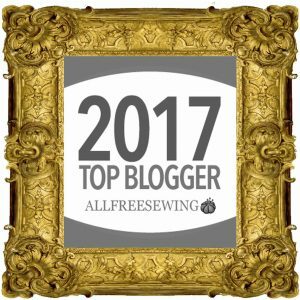 I look forward to reading your sewing info posts too. Thankyou Trish. Yes, you could go mad with a hotchpotch of leftovers with that pattern. Let me know if you make anything. I was thinking about starting a posting area for people to show their versions. Love this! But could you please point me to the pattern? I have some denim ready and waiting for a pattern as fabulous as this! Hi Kerry, far right of menu bar are the free sewing patterns. The Essential Denim Dress. Would love to see a pic when you have finished! Hi Laura, Great blog! I love following it. I can’t seem to find the pattern, even with the directions you provided…. Any help? Just click on the orange Essential denim dress words to open PDF. Maybe I need to make the route a bit clearer. Is anyone else having the same problem? Hello. Thank you for the free pattern. Can’t wait to make it. However, when I click on the link, it only gives one page that shows how to put the pieces together; not the actual pattern pieces. How many pages total should there be? Thanks for your help! Hello Angela, I am in the process of revising the way I supply patterns after seeing yours and other peoples problems. I have sorted out the Essential Denim Dress. Now, when you click on the pattern, it should come up as a multipage document ready to print. Happy sewing! This is lovely! I have a similar dress pattern that I’ve used so many times I can’t even remember where I got it, but it works in almost every type of fabric. It’s quite A-line, and I was wondering about making it slimmer; now I think I can see it working. This would also be a great way to save some of my other botched dress experiments, as I know they contain enough fabric for a dress, but not in single large pieces! LOVE your denim dress, Laura!!! Yes, it is very 70s and looks great over leggings and with the long boots. 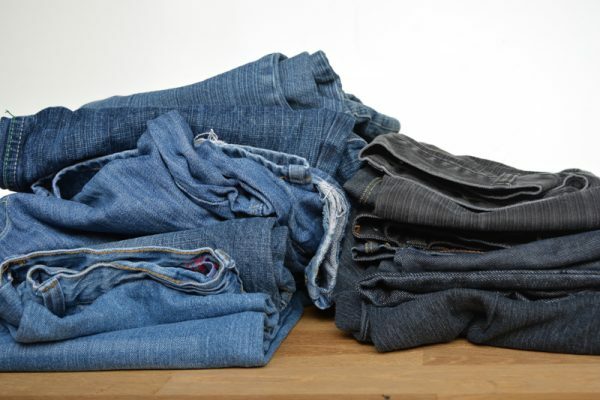 It looks like it may be possible to use pre-loved jeans for some of the narrower pieces. Love the dress, looks great. I’m having problems printing the pattern. I can only seem to get the overview one page no matter how much I mess around with Acrobat. Will keep trying as I really want to give this pattern a go. If anyone has any ideas how I can get the full print out – help appreciated! Hi Maureen, I’m afraid I have not been organised enough to take note of how much fabric each pattern needs. It’s something I need to start doing but at the moment I can’t help with that – maybe you could work it out from the measurements? Regarding the Monday drop in, that’s run by Donna, not me. Maybe you saw it in the magazine and it all looked like part of the same company. We just know each other and decided to combine our things on a page!! She is lovely and the sewing studio is a great sunny room with people dropping in and out most of the day. Maybe I will see you there as I drop in for a cuppa sometimes. Have you looked closely at the seperate instructions? In my world they are not making much sense. In 1- there is no center line to go on a fold. 2- dart only on one side. 3- talks of a “front pleat”…There is no pleat that I can see. After that, the colors of dots are mixed up as well. The directions ON the pattern itself are OK.
Maybe it is me…. Would not be the first time, but boy, IF there are pleats and things to go on the fold, tell me quick !!! I’ll be cutting soon. Will send picture. I’m in sewing class @ local community college here in So California with inspirational Italian seamtress. Eeeeek – let me check it out! I will get back to you! You’re right. 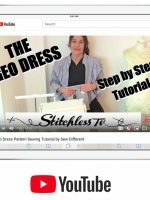 It doesn’t make any sense at all – that’s because the wording is the tutorial for the Tulip Dress and the pics are for the Denim Dress. How on earth have i done that!! Let me sort it out and I will get back to you. Sorry!! OK Anne-Marie – it’s sorted now. Thankyou for bringing it to my attention. I can’t imagine how many other poor people have puzzled over it before giving up. I can’t wait to see your version of the dress. It will be the first one I have seen someone else make. Please let me know if there are any problems with the pattern or instructions – I welcome feedback!! Do I have to cut the fabric with or without seamallowance for the size 12. Do I need a zipper? The patterns I looked at are wonderful. Can’t wait to try the denim tunic dress! I really like the denim dress. Its also adaptable to wear at work. Very nicely done. This totally is now part of my summer sewing list! Dear Laura, this looks fabulous, thank you. I have a sister who lives in Greece, and wants me to make some simple sleeveless dresses for her. 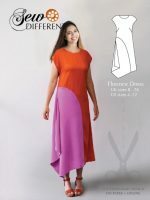 Do you have a pattern similar to this, preferably without zips or darts, as although I have been sewing for 35 years, I am terrified of both, and will also be making the dresses without being able to fit them onto her. Basically, I need a pull-on tunic-y, shift-y sundress, but have searched the net to no avail! She’s visiting me in the U.K in a week ( end of July, 2015). I know this is short notice, but a point in the right direction would be much appreciated. THANK YOU! ps I love the mix and match element! Is the demin dress for sale. It is quite lovely and just what I’ve been looking for. When I wear it there where no day without a woman tells me she loves it. Wow – thats great Karena, I would love to see a picture of it if you have one! Hi is this dress pattern for sale? Yes, it gets difficult when the size difference is more than a couple of sizes change. I have learnt a lot recently about sizing up and down and there is a lot to take into consideration other than just width. Thankyou for letting me about the payment gateway. I have just checked it and it seems to be fine from this end – sometimes it’s just an internet connection problem. Please let me know if you have any more problems with it. Happy sewing! No, you’re right!Actually it wasn’t working properly. Have another go now! Hi Sue, thanks again for letting me know. I think it is fixed now. I have been having some problems with Paypal. However I will email you with paypal details as well. Thanks for your patience. I’ve downloaded two of your patterns, which I can’t wait to try. Before I do, however, I need a bit of info. When you say there is “no seam allowance”, do you mean that you haven’t specified a particular seam allowance or that we are to ADD a seam allowance when we cut, i.e. the cutting line is also the stitching line. Thanks. Never mind–just saw the answer above. Sorry. C.
Look forward to seeing the finished items Carol! Hi I bought your lovely pattern the other day and am trying to print it out today….my printer is not printing the size out right and I can’t seem to alter it anywhere to print 100% like your test square tells me to do…the printer has all other size options like letter, legal, 8×10 etc but nowhere can I find 100%…any ideas? desperate to make this dress before my hols!! Yes, you are looking for SCALE. It will probably be set to fit to page automaticly – change it to 100%. It is probably on print set up or the very front page. Set your paper size to A4. Any more problems just let me know and I will try and find a detailed tutorial for you. Hi! I felll in love with your Essential Denim Dress. I like to reuse the jeans, and I could do it! It’s not the best photo but here you can see what I did. This is a really great make Karena, would you mind if I used the photo? Hi. I love the dress. I totally understand the need to charge for your work but would you please update the main page of the post, so it no longer says “free pattern.” It seems deceptive to lure people in, and then announce it is not free any longer. Thank you! Hi Jenny. I know it is really frustrating for people and they feel they are being misled. I think what you are seeing must be on Pinterest which I unfortunately do not have any control over. Other people posted the original “pin” from my site when it was free and there is no facility for me to change it.